Share the wonderful healing benefits you are receiving using your BioMat with your family, friends and co-workers. All you need to be an Independent Representative (distributor) is sign the agrement form and pay a one time fee of $80, you will also receive a Distributor Kit. If you haven't yet and are planning on purchasing a Biomat why not sign up at the same time as an independent representative for RichWay and make money when your friends buy one? And make money when they sell them? You get paid a commission on every sale you make. You can earn bonuses from sales your customers make. An independent representative who sponsor 2 Gold ISA's. An independent representative who sponsor 2 Emerald ISA's. Participation in the Royal Family Bonus Pool - calculated by taking 1% of the company's gross sales for 1 year. This amount is then divided by the total number of Royal Family members according to their Binary bonus volume. For each subsequent year a Royal Family member must sponsor 4 new Diamond Level ISA's to participate in the Pool. Richway & Fuji Bio Inc. offers a diverse selection of fine merchandise at competitive prices. Independent representatives may earn a substantial retail profit selling Richway & Fuji Bio Inc. products to the ultimate consumer. In addition, independent representatives are eligible to earn weekly quick pay, sales and training bonuses. These bonuses are determined by the number of sales made within each leg of a representative's organization. At Gold Executive Status - When a Gold Executive generates 6 or more Business centers in each Leg of one of their Sales Increments, they earn a $400 Binary Bonus. At Emerald Executive Status - When an Emerald Executive generates 6 - 11 Business centers in each Leg of one of their Sales increments, they earn a $400 Binary Bonus. When they generate 12 or more Business centers in each Leg of one of their Sales increments, they earn an $800 Binary Bonus. At Diamond Executive Status - When a diamond Executive Generates 6 - 11 Business centers in each Leg of one of their Sales increments, they earn a $400 Binary Bonus. When they generate 12 -17 Business centers in each Leg of one of their Sales increments, they earn an $800 Binary Bonus. When they generate 18 or more Business centers in each Leg of one of their Sales increments, they earn a $1,200 Binary Bonus. By becoming a Richway & Fuji Bio Inc. Independent Representative, you take an important step in securing what could become a lifetime source of income for you and your family. Richway & Fuji Bio Inc. is committed to the development and enhancement of the human potential, rewarding individuals for outstanding commitment and achievement. 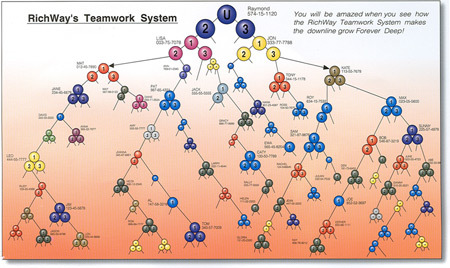 Richway & Fuji Bio Inc.'s innovative Sales Compensation Plan rewards outstanding performance, and allows everyone endless opportunities Retailing Richway & Fuji Bio Inc. products.